In February 2010 I wrote about Cambridge’s City Centre management organisation, Love Cambridge, considering raising taxes. On Friday the 15th of July 2011 Love Cambridge took some more steps towards levying a tax by sending out a survey to business rate payers in the city, asking what they’d like to see money raised from increasing business rates spent on. The survey, which will I expect be the first many business rate payers in the city will have heard of the scheme, doesn’t really make clear what is being proposed. The text introducing the survey doesn’t mention “rates” or “tax” and certainly not “higher rates” or a “tax increase”. Recipients would have to research what a “Business Improvement District” was themselves to find out that levying an additional tax was what the survey was actually about. I think this is scurrilous behaviour, the survey appears to be an attempt to gain evidence that there are lots of things in Cambridge which business rate payers would like to see more money spent on; evidence which will then no-doubt be put forward to back up those seeking to levy extra taxes. The survey also doesn’t make clear who it is being sent out on behalf of. The most prominent logo on the survey is that of “CBbid”, there are no details given of what CBbid is, (there is no registered company with that name). I suspect it may be new trading name / pseudonym which “Love Cambridge” have come up with for themselves to use in relation to this bid. They may be wishing to down-play the role of Love Cambridge as the Love Cambridge staff are funded by the City Council and the idea of Business Improvement Districts is that they’d be initiated, from the bottom up, by businesses, and not astroturfed by groups which stand to benefit from organising them. There is relatively little sign of things which would be a long term investment in the city centre being considered by the survey. On the list of ways extra tax revenues could be spent for example are “Street based entertainments” and “City Centre Ambassadors (meet and greet staff)”. The mind boggles as to what could be envisaged, uniformed staff like flight attendants? maybe costumed characters? – many do say those in power are trying to turn Cambridge into a disneyland. Whatever form they might take, these are things which are not going to have a long term, enduring effect. Other suggestions are firmly in the realm of what I’d expect to get for my taxes already and I’d have thought businesses would expect to get for theirs, like “Street lighting”, “Police presence during the day” and “Police presence during the night”. Those aren’t the kinds of things I’d expect to be asked to pay an additional chunk of tax to get, we’re already paying for those. There are some other odd elements to the survey. A new web domain: cbbid.co.uk has been registered, by Limewash Media Design yet despite it going out on all the surveys there is no web content on that domain yet. Limewash has registered the domain in its own name, something I consider bad practice, and something else which obsfucates who is actually behind “CBbid”. We ask you to sign your name to conform with the data protection act. This is oppressive and intimidatory nonsense in my view; I can’t see any part of the Data Protection Act which those not signing their survey responses will be in breach of. This survey was sent to businesses in Cambridge on Friday the 15th of July 2011. As the survey doesn’t mention the proposed tax increase there is no opportunity for respondents to comment on it. If people oppose the scheme there is no space within the survey for them to express this view. The suggested ways of spending the revenue generated from the extra tax all appear to relate mainly to encouraging shopping; there is no sign of aspects which others who may end up paying the extra tax could benefit from. Service providers such as accountants, estate agents, lawyers, media companies and recruitment consultants will all be hit by the extra tax as will technology companies and others. There is an online version of the survey available at : http://www.surveymonkey.com/s/CBbid. Love Cambridge has not made any reference to the survey on its public website, no press release was published online accompanying its release. Cambridge City Council has also not added the survey to its consultations page, or issued a press release drawing attention to it. The area covered by the survey has not been publicly identified. It appears there may be an attempt to run this survey “under the radar”; usually such consultations come with events, and plenty of material online, to help enable those responding to do so from an informed position – none of this has happened. The consultation is open until the 26th of August, this is often regarded a time when people try and sneak such things through. I understand that the current expectation is that the Cambridge Business Improvement District will encompass the core of the city centre; and it is anticipated that it will be substantially smaller than the area to which Friday’s survey was distributed. Rates are paid on a number of public buildings so our councils will probably have to respond to the survey. Libraries for example pay rates, as I expect the City Council probably do in respect of the Market Square market, it will be interesting to see how they respond, as I suspect it is unlikely the areas affected will get extra funding to cover the increased amount of money going round in circles. A similar, but more narrowly focused, scheme is under consideration for funding improvements to Hills Road, though the last time I heard that mentioned was September 2010. From what I can tell the schemes are slightly different in that the Hills Road scheme is to involve borrowing lots of money to do the work, then paying off the loan using an extra levy on the business rates on the road. I can’t see any provision preventing an organisation running the Business Improvement District from borrowing money (its been reported that a BID company has sought a loan), but the idea of the BID appears to be about spending the tax receipts as they come in. I certainly don’t think we ought be increasing the public sector debt to fund meet and greet ambassadors. In relation to Hills Road (the route from the station to the city centre) I have previously commented that I think the benefits of improvements there will aid the whole city and it would not be fair to ask businesses along the stretch to pay disproportionally towards their cost. The Chairman of Love Cambridge, Ian Sandison, tweeted to say he was going on holiday to the Greek island of Naxos and was out of Cambridge as the survey was distributed. He announced he would be uncontactable saying he had his “iphone email disabled”. As well as Mr Sandison being on holiday, Love Cambridge has launched this new survey while it is in the middle of recruiting a new board member to advocate for independent businesses within the city centre. The recruitment being required due to independent businesses not being happy with the current incumbent who didn’t find enough time to dedicate to the role. It is notable that the imminent publication of the survey, was not mentioned when Love Cambridge gave their annual report to the city council just ten days or so previously. I noted this omission in my report on that meeting. Love Cambridge’s annual report presented on the 5th of July made no mention of the Business Improvement District proposal. I have no doubt that if “CBBid” had been mentioned councillors, and the public, would have asked questions about it. There are a number of safeguards present in the process of introducing a Business Improvement District. If a proposal is made then the council has to run a referendum of business rate payers in the area concerned, to pass the referendum it has to be supported by those voting on behalf of both the majority of properties by number and by votes from properties making up a majority of the rateable value in the area. routes of appeal to the secretary of state. The relevant legislation is The Business Improvement Districts (England) Regulations 2004 and Part Four of the Local Government Act 2003. I think giving people, and businesses, freedom to do things for themselves, is fantastic. I think the often there are situations where the state doesn’t need to be doing things itsself, its role could be simply facilitating, and giving permission for others to get on with things. I think the Business Improvement District legislation has fantastic potential to, for example, allow those running shops on a particular street to get together and improve the trading environment. The Business Improvement District in Birmingham’s Broad Street is a good example. The force of law, and the collection of funds by the local authority, means all those benefiting from the scheme have to contribute – something a voluntary scheme would not be able to ensure. If we could have such schemes on a small scale in Cambridge, for example to improve the shop forecourts of the shopping centres in the residential areas I can see how perhaps public money raised via general taxation could have been saved. I do not think a tax hike for all businesses in a broad swathe of Central Cambridge is the way to go. I wouldn’t want to push non-retail companies out of town and leaving the city centre just one big shopping mall. I wouldn’t want to see companies deterred from operating in the city. If a tax could target only retail units on a street, that might make it a fairer option, but the current legislation doesn’t incorporate such flexibility. To lobby for a greater fraction of the business rates raised in Cambridge to be retained in Cambridge. One way we can do this is using evidence, such as that in the EEDA Cluster Report to argue for national investment in the area. A mechanism the government is introducing called an “Enterprise Zone” designation, allows any increase in business rate income to be retained locally. Cambridge should certainly make an application for such designation. To elect better local councillors and where there are problems with things like policing, streetlighting, public toilets, and street cleaning (as there are in Cambridge) demand that they address them, using the resources we already put at their disposal. Love Cambridge has the potential to co-ordinate the lobbying of the councils on behalf of those with an interest in the city centre, but so far is not doing so. Love Cambridge is not under democratic control. If it was allowed to raise taxes there would be taxation without representation. Love Cambridge is also not subject to Freedom of Information law, and has refused to voluntarily comply describing it as “undue bureaucracy”. I suspect council officers empire building may be behind these proposals; they of course would love to be able to raise and spend taxes without the inconvenience of pesky elected councillors getting in the way. This entry was tagged Cambridge, City Centre, Democracy, Tax, Taxation on July 16, 2011 by Richard Taylor. I have asked Cllr McGovern if anything in the article is inaccurate and invited him to comment. The word ‘bid’ implies that there is a pot of money available, and that completing the survey will help Cambridge to win it. Very disappointing that Neil McGovern is resorting to calling you ‘ill informed’ rather than providing a bit of information for us. I’m guessing he must know something about this. There is a Cambridge City Council full council coming up. I would like to make a request to use the public speaking slot at the 21 July council meeting. The subject I would like to raise is the “CBbid” Business Improvement District. Via the public speaking slot I would like to ensure councillors are aware of what is being done; and I would also like to seek to get more information about the proposals into the public domain. * What is CBbid, how is it linked to i/ Cambridge City Council and ii/ Love Cambridge ? * Why did the recent survey sent to business rate payers not make clear who was behind CBbid, or that a business rate increase was being proposed? I would also point out my view that CBBid, if not run directly by the city council, amounts to taxation without representation and while Love Cambridge is not being run to the same standards of openness, transparency and accountability as the council it should not be given any role in raising and spending taxes. I note that I have sought a response to my concerns from Cllr McGovern, but he has dismissed them as “ill informed scaremongering”; I would like to try and use the public speaking slot to prompt the release of more information so that I, councillors, and Cambridge’s residents and rate payers can be better informed about the proposals. I would appreciate it if you could let me know if any written questions are submitted to full council by councillors which cover the subject of CBbid and may negate the need for me to raise the matter myself. I suspect CBBid would have been raised at the Strategy and Resources Scrutiny Committee, but neither Cllr McGovern or Love Cambridge mentioned it there when related matters were debated. I acknowledge receipt of the question and can confirm that there isn’t a written question on the subject/issues you have outlined in the email below. I’d like to use the public speaking slot this evening to talk about the proposed new tax on Cambridge businesses. This is a tax which would be collected by Cambridge City Council via increased business rates as part of a proposed Business Improvement District scheme. My concern is there isn’t enough information available about what’s proposed. I’m here this evening to try and get some more information into the public domain, and to urge councillors to look at what’s being proposed and consider if they’re happy with it. Last week a survey went out to business rate payers in the city. At the top was a logo for “CBBid”. What is CBBid? It’s not a registered company. Is it a pseudonym for the city council or for Love Cambridge? 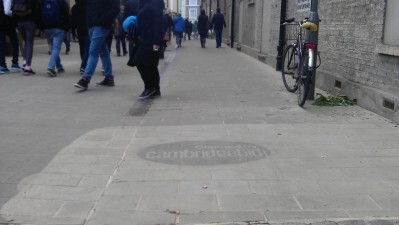 If so why are Love Cambridge and the City Council not putting their logos on the material? Why is there no content on the new CBBid.co.uk domain that was printed on the surveys? Why does a search for CBBid on the city council website come up with no results? The survey didn’t make at all clear that a tax increase was being proposed. Recipients would have had to research a Business Improvement District for themselves to find that out. There has been a scurrilous lack of being honest and up-front here. I can see how Business Improvement Districts have worked elsewhere and could work in Cambridge. They could have been used to get more funding from businesses for improvements to Burleigh Street, or the shopping centres in residential areas. As it is though a blanket tax on a large area is proposed. That’s what makes it just a tax, and not local businesses getting together to improve their trading environment. I wasn’t very impressed by the ideas for spending the additional tax levy. Police during the day and police during the night were options – don’t our taxes pay for that already? And what’s envisaged with “meet and greet” staff – would they be in uniform? In costume? Can we have an assurance they won’t be any worse than the punt touts? One concern I have is that the proposed spending appears designed to help retail businesses. This risks the diverse nature of the businesses in the city centre and could push recruitment consultants, accountants and others out. So what’s going on, imagine if you were an empire building council officer, there’s probably nothing you’d like more than raising millions of pounds of tax revenues and being able to spend them without having to deal with pesky elected representatives. When Love Cambridge was formed, Cllr Cantrill, who was then the executive councillor responsible, gave an assurance, in response to a public question I asked at a council meeting that it would be run to the same standards of openness and accountability as the council itsself. That hasn’t happened. I think it needs to happen before Love Cambridge is allowed to raise and spend taxes. Love Cambridge appeared in-front of the Strategy and Resources scrutiny committee a week before the CBBid survey was sent out but they didn’t mention their plan to raise taxes. I wasn’t convinced by what they did say either: they made incredible statements about their funding, and revealed confusion over the council’s role in appointing a new advocate for independent businesses to serve on the Love Cambridge board. The survey was sent out while Love Cambridge is without effective residents’ and independent retailer representatives, and while the chairman was on holiday, uncontactable, on a Greek island. I contacted Cllr McGovern about my concerns, however he dismissed them as “ill informed scaremongering”; I don’t want to be ill informed, I don’t want Cambridge’s businesses, residents, and councillors to be ill informed; that’s why I’m standing here this evening. If you’re not honest about what’s proposed then the survey results will not be much use. Yes you’ll find out that there are things people would like to have, but, they’ve not been asked if they’re prepared to pay for it. The name CBBid makes it sound as if there is a pot of money available; the survey was not clear this is not the case. Will CBBid be able to borrow money? Is this a replacement for, or in addition to, the other local tax hike being considered, the Tax Increment Financing scheme for Hills Road? Does the council have a process ready to consider if it will use its opportunity to veto the scheme, in the short timeframe the legislation provides for it to do so? I often use the public speaking slot at meetings to point out where I think the Liberal Democrats are doing things contrary to the manifestos they stood on. In this case I don’t even have to refer to the manifesto, what they stood on in is in their name: “Democrats” and what’s been proposed here is nothing less than taxation without representation. Maybe they’ll try and fund the ‘shopper’ bus from this tax. I asked my question at the full council meeting. When I said the only hits for CBBid were for material I’d written the council chamber laughed. Cllr McGovern replied. He thanked me for advance notice of the question and said that would enable him to address matters I’d raised but not reached in the three minutes I had to ask it. CBBid is not an organisation but “a project”. He said an organisation would be set up if the project progressed towards becoming a BID scheme. 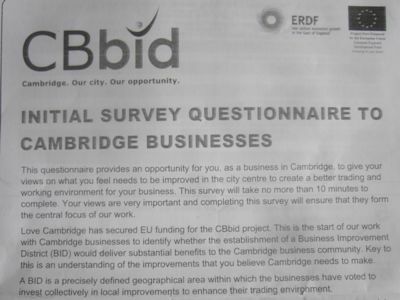 The reason the Cambridge City Council logo wasn’t on the survey was that the CBBid project was being run by the Association of Town Centre Management (alongside two other BID projects). CBBid wasn’t led by the council and would need to be “business led”. Depending on the results of the survey it might be that only a small area, or small areas, of the city get covered by the BID. As it was an early stage, it would have been “premature” to mention the fact the proposed “improvements” would be funded by a tax increase when introducing the survey. (I disagreed with this strongly when I was allowed to respond). CBBid had been mentioned at the Strategy and Resources committee and in Love Cambridge’s annual report which was presented there. The referendum made the proposals “fully democratic”. Councillors had been given a briefing on the proposals. While responding I asked Cllr McGovern to place the information he’d given in his answer, and the briefing materials received by councillors, online so those with the survey could find the background information. I also asked if the council was prepared to properly consider if it ought veto any proposals brought forward, eg. if there was poor turnout in the referendum, perhaps due to a lack of information about the plans. Cllr McGovern had also claimed that Love Cambridge was quite separate from the council, so I highlighted the links. Cllr McGovern has tweeted to say he’s off to Bosnia at 2am on the morning after the five hour full council meeting which went on to 11pm; so while he invited me to email him with any outstanding questions I won’t be doing that just yet; and he has in-fact covered most of the points in any case. His answers do raise more questions, but perhaps for now we’ll just wait and see. The key thing I want to know now is where do I need to be looking for the next step, if the council and Love Cambridge are not involved – where will I find the outcomes from the survey? I have reviewed Love Cambridge’s annual report as presented to the scrutiny committee and there is no mention of the CBBid Business Improvement District proposal. Cllr McGovern said there was. There’s now an article about CBBid on the Cambridge News website. About 1,300 questionnaires have been distributed to companies asking them what they want to see change and whether they would be prepared to pay for this. This is a lie. The questionnaire does not ask business rate payers if they would be prepared to pay for any projects, just if they would like to see improvements in various areas. Lie is a bit of a strong word; I’m sure Chris Havergal didn’t deliberately set out to deceive anyone when he wrote the article. There is an online CBbid survey here,which doesn’t seem to include anything about paying for the Business Improvement District. Cambridge News is the “media partner” of Love Cambridge. That may explain a lot, @David. Cambridge First published an article on the CBBid in their 4/8 paper but it did not appear online. Their article included comments from Richard Taylor. The News article came out two days before that paper despite Chris Havergal having been on holiday at the time the CBBid was raised at council and it being two weeks between the council discussion and both articles coming out in the same week. Interesting site. Am just wondering what the point is? Thought it was some sort of spoof to start with. Are you people for real? You are not a long lost relative of Senator McCarthy are you? Not everyone in your local council is out to rip you off you know. Instead of sitting on the sidelines, sniping and whining, why not stand? Do something within rather than without? Go on I dare you! On the 21st of June 2012 Cambridge businessman Jeremy Waller of Primavera on Kings Parade used the open forum at the West/Central area committee. Mr Waller described how the proposals amounted to a tax-hike for Cambridge businesses, and questioned how appropriate this was in the current economic climate. Mr Waller asked how the council would be making its decision on if to support the new tax or not. Noting the council would have a significant say in any referendum due to the property it owns, he asked which committee would be deciding how the council’s votes in that referendum would be allocated, and who would be deciding which way they will go. Councillors looked blank or puzzled so Mr Waller explained that for the tax to be introduced a majority of business rate payers in the area both by number, and rateable value, have to support it in a referendum. Mr Waller noted the new tax could have an impact on residents, who would not get a vote in the referendum on if the tax is levied or not. He said that shops and services which local residents like might be forced our of the area, or out of business, by the new tax. Mr Waller stated the proposals amounted to a 1% rise in business rates for the Market Ward area of the city. Cllr Smith responded. Cllr Smith is the Executive Councillor for Customer Services and Resources, and said she was ex-offico a board member of Love Cambridge. She started her answer by stating that the CBBid organisation and Love Cambridge were in effect one and the same. Cllr Smith told Mr Waller, and the committee, that the decisions on the council’s support, or not, of the new CBBid Cambridge tax would be taken at a meeting of the council’s Strategy and Resources Scrutiny Committee on the 9th of July. Cllr Smith invited Mr Waller to use the public speaking slot at that meeting. Cllr Smith described the current activities of Love Cambridge and the CBBid organisation as amounting to “very preliminary discussion”. Notably Cllr Smith gave no indication that the council was ready to use its veto on the scheme. Michael Wiseman, the Director of the Grafton Centre was present at the meeting, he was invited to comment. Mr Wiseman described himself as a member of the “CBBid taskforce” he simply stated that there was consultation underway on the scheme and he claimed that all similar schemes run elsewhere had been successes. He also noted that a “BID manager” had been appointed. Mr Waller had brought new leaflet about CBBid which he said had he had received the day before to the meeting. It promoted the http://www.cbbid.co.uk website which I note now contains some content. There is a downloadable newsletter (Caution 7.5 MB 3 page PDF!) – Hosted by Limewash Media. The newsletter is dated Autumn 2011. The pamphlet brandished by Mr Waller at the meeting is not available online, the CBBid site appears to contain no up-to-date material. Neither Love Cambridge nor the CBBid board are subject to FOI so I have no guaranteed route for obtaining a copy. Mr Waller lent me his copy to briefly read through in the meeting. It contains a list of those on the CBBid board – these are the unelected people who want to raise and spend taxes in Cambridge – I noted there were no representatives of residents, nor elected councillors, on the board. From the items suggested as areas for the new tax income to be spent, it appears the CBBid board aspire to take over the funding of the Cambridge Community Safety Partnership, the projects listed which I saw were those which are already established so the proposal appeared to me to be to change where funding comes from rather than to provide new and additional funding. The pamphlet also contains a map of the area covered by the new tax. This is something else which has not yet been made public. I was interested to see the Cambridge Colleges mentioned in the leaflet, and wondered if they have rateable values and pay business rates. It appears they do Trinity College for example has a rateable value of £241,000. Despite there now being content on the CBBid.co.uk domain, it is still registered in the name of Limewash media. This means the identity of the organisation behind CBBid is being obfuscated. Clearly Cllr Smith has stated directly that CBBid and Love Cambridge are one and the same, but that needs to be clear to everyone, not just West/Central Area Committee attendees, neither the City Council or Love Cambridge names or logos are on the CBBid.co.uk website. CITY businesses could face a tax hike to pay for extra services. The proposals for more money to be paid through business rates are part of plans for the city centre to become a Business Improvement District (BID). This means shops in a certain area would have to contribute to a fund which would then provide additional services as well as a joint purchasing power. A survey has been sent to city centre businesses asking for their thoughts on what services could be offered, but no mention of the levy was made. Ian Sandison, chairman of Love Cambridge, the city centre partnership behind the plans, said a BID could only go ahead if a majority of businesses voted in favour and the plans are in the early stage of consultation. He said Cambridge is one of three areas being looked at for new BIDs. But the council and Love Cambridge have been criticised for not being up-front about a potential tax increase. Richard Taylor, a Cambridge blogger and political commentator, said the use of a survey to entice businesses with improvements without mentioning the tax was “cynical”. Mr Taylor also had concerns about how the BID was being presented. “They can’t say it’s a grassroots movement when the council is behind it,” he said. He added that while a “blanket tax” was not a good move, a BID scheme might work on smaller scales. David Wilshin owns the Cambridge Cheese Company in All Saints Passage. He said he would dismiss such a tax out of hand. Mr Sandison stressed the money paid in a BID should not be called a “tax” but a “levy”. He said: “When the questionnaires come back we need to see whether businesses have an appetite for taking forward any ideas which may improve the trading environment in Cambridge. Cllr Neil McGovern, executive councillor for customer services, said Mr Taylor’s views that “we are trying to push something through” was inaccurate. “It’s about businesses doing what’s right for them. It may well be that businesses don’t want to have a BID in the area,” he said. At a full council meeting Mr Taylor accused the council of a “scurriless lack of openness about what’s going on”, to which Cllr McGovern said the council’s involvement in the BID was minimal. He said it was funded by a European grant secured by Love Cambridge. Once voted in, a BID exists for a minimum of five years. Thanks for that Sadie, I’d never seen that article, and you are right it’s not online. The Guildhall will be in the zone, the council will be charged ~£5000 a year in “Cambridge Tax” for the Guildhall; might this be what pushes the realisation of Cllr Hipkin’s proposal to move the council out of central Cambridge? The council will become liable to pay significant amounts of “Cambridge Tax” on its Regent St offices, and probably Parkside Pools too. Another major non-retail use is University of Cambridge laboratory space. Much of this has a significant ratable value, so the “Cambridge Tax” will hit it hard. Will the “Cambridge Tax” be added to the overheads of Cambridge scientists, making their research grant applications appear more expensive and less good value for money leading to research funders spending their money elsewhere? Registered charities and registered community amateur sports clubs (CASCs) are entitled to an 80% reduction on their business rates bill. We have discretion to make a further reduction to the remaining 20% of the bill. So the colleges (as charities) might get a huge say in the vote to bring in the Cambridge Tax, then be exempt from paying all or most of it? To agree the mechanism through which the Council will exercise its vote. That’s a highly unusual recommendation because no recommendation is actually given to councillors as to what mechanism they might come up with. Love Cambridge’s annual report, and a report on the proposed Cambridge Tax, were on the agenda for Cambridge City Council’s Strategy and Resources Committee on the 9th of July 2012. The report from Love Cambridge failed to differentiate between public and private funding for the organisation. Labour leader Lewis Herbert stated there is no effective resident representation on Love Cambridge and asked for more consideration of residents and a move away from solely focusing on business. Cllr Herbert said that the committee’s December 2008 resolution calling for resident representation had effectively been ignored. Labour members cited the absence of seats in the Lion Yard shopping centre as an example of the needs of residents not being considered. Cllr Benstead asked if Love Cambridge’s funders would both fund Love Cambridge and pay the new “Cambridge Tax”. The Love Cambridge chair said they probably wouldn’t. Asked if all Love Cambridge’s major funders were in the Cambridge Tax zone, the committee was told “Yes”, though the County Council was mentioned as a funding source which might be unaffected by the new tax. Emma Thornton, the city council’s Head of Tourism and City Centre management, who also works on Love Cambridge, made a vacuous, internally inconsistent and cliché ridden speech from which it was impossible for me to extract any meaning. Councillors, especially Cllr Smith looked baffled. Cllr Smith spoke to say she had only been the Executive Councillor in this area for seven weeks and was still in a position of listening and learning. Cllr Smith said she understood the concerns about secrecy and lack of public involvement in Love Cambridge. Cllr Smith noted she had not yet signed a form giving her consent to being made a director of Love Cambridge despite the full Cambridge City Council nominating her for the position. I think the implication might be that she will only serve on the board if it operates in a more open and transparent manner and if the organisation does better at working with all those with an interest in Cambridge. Cllr Rosensteil joined the calls for Love Cambridge to do better at working with the city’s residents. Emma Thornton stated the council would be advertising next week for a “Mill Road Champion”, how, or if, that is connected to the problems with Love Cambridge wasn’t made clear. Thornton said she would like to see a “Mill Road Tax” as a “satellite scheme” to the “Cambridge Tax”. Labour leader Cllr Herbert expressed a concern that the Cambridge Tax would make the commercial vs residents imbalance in influence over the city centre worse. A member of the Mill Road Society, Jannie Brightman, spoke to the committee on behalf of the organisation. She expressed concern about the impact the Cambridge Tax could have on the city centre, she said it would turn it into a shopping mall, albeit a shopping mall without walls. Mrs Brightman said the proposals would push Cambridge further towards becoming a “clone town”. She expressed concern about the prospect of more private security patrols in the Cambridge Tax area which she noted was to include some of the city’s green spaces. She noted how protests and gatherings have already been stopped in the shopping centres (eg. Vodaphone protests) and said she was concerned this kind of heavy handed approach might extend across the city and prevent protest and freedom of expression including on the green spaces. Mrs Brightman said that extra private security guards did not make her feel safer and that she wanted to be policed by police officers or PCSOs. Mrs Brightman said that while Mill Road is not included in the Cambridge Tax area, the Mill Road society is so concerned about the potential impact on the city centre as a whole that they are opposing the scheme. Effective privatisation of public space was she said the key, core, concern, as well as the impact on civil liberties. Luke Crane, an employee of the Cambridge Tax organisation said that the Cambridge Tax zone area had been drawn to include some areas, such as the green spaces for reasons of aesthetics (though he was later to contradict this, saying it was in fact so the organisation could carry out activities on the spaces). Labour members said they would not support the zone if it included the River Cam and green spaces. Recent Green to Labour defector Cllr Pogonowski asked for the map to be accurate rather than aesthetic. Other criticism of the map of the area followed, with Cllr Herbert questioning why the outline had been drawn on a 1950s map of the city. A second public speaker addressed the committee. She said she had nothing to say really and she had just been brought in by the Cambridge Tax organisation as a supporter. She said she supported the Tax for reasons of fairness, saying she ran two businesses on Trinity Street, but only about 6-7 of ~22 businesses on the street contribute to Christmas lights, a tax she said would be fairer. Cllr Benstead complained that this meeting was the first time the Cambridge Tax proposals had been put before councillors. He went on to talk about the area covered, but the meeting’s chair, Cllr Brown, stopped him, saying the proposals were not a council project. Cllr Benstead responded to say: “That’s a problem”. Luke Crane of the Cambridge Tax organisation said the map was not set in stone. Asked why Mill Road was excluded Mr Crane said the majority of businesses there opposed the scheme. When Cllr Benstead asked if the area was excluded because the a referendum on the new tax would have been lost if it was included, Mr Crane denied this. One of the City Council’s top officers, Director of Environment, Simon Payne, (Basic Salary £88,646 / year) expressed support for the Cambridge Tax calling it a “fantastic opportunity”. This was a very odd officer intervention as he contributed to express a personal opinion rather than to inform debate or answer questions. Emma Thornton said she wanted to see the Cambridge Tax revenues spend on more “City Rangers to welcome people”. Cllr Smith said she knew no more about the Cambridge Tax proposals than the public. Cllr Smith questioned if Mill Road could be included later in the main Cambridge Tax scheme. Mr Crane said that would require another referendum. Cllr Smith said the council had to place all its votes the same way in the referendum. (I think this is not true, I can’t see anything in the regulations requiring that, and an abstention is also an option). The committee was told there are 750 business rate payers in the Cambridge Tax area, and the tax would extract £800,000/year from the local economy. The university and colleges hold 56 votes, and the city council 14, though these could increase if there are empty properties of which they are landlords. Councillors decided to hold a special extraordinary meeting of the Strategy and Resources Scrutiny Committee, probably in September 2012, to decide on the council’s position in relation to the Cambridge Tax proposals. Only twenty or so days after the Mill Road society raising its objections at the scrutiny committee, and my reporting of them in the comment above on the following day, the Cambridge News has published an article headlined “Independents fear business levy idea”. This will be on 11th September 2012 – 7.30pm in the Friends Meeting House in Jesus Lane. 7.00pm 20th September in the Granta Suite at the Double Tree By Hilton, Cambridge. I, via Sci7 Ltd, have made a spreadsheet of addresses of potential Cambridge Tax (CBBID) payers available. This is a list of commercial property addresses with rateable values of £20,000 and above in Cambridge’s Market, Arbury Romsey, Petersfield, and West-Chesterton wards. It could be used for a mailshot, perhaps addressing: “The Rate Payer” or similar at each address by those wishing to campaign during, or before, the referendum. There are a few lines for things like green spaces which ought be removed before such a mailing. There are just under 1000 addresses listed, whereas the CBBid organisation say 750 or so properties would be caught by their criteria. As the area is not yet fixed, and because the impact will be on the wider city, I have included wards with significant commercial activity near the city centre. Source: Valuation Office Agency website. At the public meeting organised by the Mill Road Society on the 11th of September 2012 it was revealed that the business proposal linked above had jut been published, with councillors only receiving it the day before. If the Cambridge Tax proposals are judged contrary to that they could be vetoed. I called on Cllr Smith to ensure that she was prepared to assess if should deploy the veto or not and to ensure she had a report prepare for her on her options and a system in place to ensure the decision could be taken within the tight statutory time scale. About 50 people attended the meeting. The Liberal Democrat’s Cllr Smart didn’t appear to have much of a clue about what was being proposed, making a number of basic errors, such as saying all traders get a vote (they don’t, only rate payers with a rateable value of over £20,000 do). Labour Councillors said they were yet to take a view, but stressed they thought it important that decisions about the public realm were made with resident’s input. I said the Cambridge Tax proposals amounted to taxation without representation and were an erosion of the basic principles on which our democratic society is built on, and potentially a very slippery slope. The Mill Road Society explained they called the meeting as they were concerned about the lack of information available, and lack of awareness of, the proposals. Janet Brightman said she was concerned about the council giving control of the city centre to a private company, and thought that removing photographers, homeless, skateboarders and others would be the result of a policy of “cleaning up” the city. Janet Brightman expressed concern about the restriction of liberties including the right to protest. Cllr Herbert cited toilets, the market square, seating and more as examples of areas where residents were not considered under current city centre management. Cllr Herbert said Labour would not support any changes to City Centre policing which would displace problems such as street drinking; he called for a city centre committee to be reinstated, saying the West/Central Area Ctte wasn’t suited to the role as it contains only representatives of those who live in the city centre. Cllr Herbert said the public realm is everybody’s and the business community has no special right to control them or take decisions about spending money on them. Cllr Smart, Liberal Democrat, said she didn’t know how BIDs elsewhere had gone, but that didn’t matter, as all that was relevant is what’s proposed here. Concerns were raised that street traders and charity collectors could be forced out; it was suggested Snowy Farr would not have been allowed to operate by a Cambridge Tax organisation. Trader Chris Powell said the Cambridge Tax would empower him. He said anyone who was against the Cambridge Tax was against Christmas Lights, or against cleaning up chewing gum from the streets. Jeremy Waller said he feared the Cambridge Tax and its organisation; he said it would spend huge sums on staff. It was suggested the Cambridge Tax is like going back to the Victorian Era, giving only property owners a vote. Tom Woodcock said it was outrageous the city council didn’t decide if the Cambridge Tax is implemented or not. The “exclusion scheme” to be run by the Cambridge Tax organisation raised concerns. Council officers said such a scheme already operated and was just to be extended. A local teacher likened the introduction of the tax to the enclosures and the privatisation of schools and hospitals. Mr Cooper, a local resident, complained there had not been a very high profile “launch” of the Cambridge Tax proposal. The meeting was told Cllr Bick will decide how to use the council’s votes in the Cambridge Tax referendum. Cllr Benstead accused the Liberal Democrats of predetermination, pointing to positive quotes they’ve given about the proposals in the business plan. Cllr Kilian Bourke called on his party colleagues in the city council to provide clarity on what’s proposed. The Mill Road Society said in their canvassing they’d found “a single figure percentage” of businesses were aware of the proposals. It was confirmed the Cambridge Tax organisation would not be subject to Freedom of Information law (despite being able to raise and spend taxes). I thought it was a productive and well chaired meeting. There is no mention of any conflict of interest, for example if the Cambridge News will act as a publishing partner with the new organisation. It has worked closely with Love Cambridge. The article is entirely one sided; though journalist Chris Havergal tweeted to say the alternative view would be presented in a separate article (which is yet to appear). Those behind the ballot to make central Cambridge a BID – a partnership of leading retailers, shopping centres, independent shops, city and university officials and other businesses such as The Cambridge Building Society – have been consulting more than 1,500 businesses about the idea over the past year. It fails to note that the City Council has had a key role in “astroturfing” the BID through its support of Love Cambridge. It appears as with the article quoted in comment 24 another Cambridge News article raising criticism of the Cambridge Tax is not being placed online. The Mill Road Society have it absolutely right. The CBbid proposal is undemocratic and wrong in principle. I am particularly concerned that this scheme will extend safety and security issues across the city centre at he behest of businesses with no input from Cambridge residents. Why should the management of the Grand Arcade, for example, believe that it could extend its private security remit to Parkers Piece. I note too that in the many leaflets the Liberal Democrats and Councillor Smart has pushed through my door none have informed residents of this bid. Coherent plans for the development and improvement of the social spaces of Cambridge City Centre are welcome but not just at the behest of selected business rate payers. CAMBAC describes itsself on its website as part of Love Cambridge, and Love Cambridge has staff paid for by the City Council and works out of council offices in the Guildhall. The police can issue these exclusion notices; even though they are not yet an instrument of the state. Vicky Hornsby is the CAMBAC Manager, presumably one and the same as the “partnership manager” she has an @Cambridge.Gov.UK email address vicky.hornsby@cambridge.gov.uk. Details of “exclusion notices” issued by CAMBAC are recorded on the Police National Computer. Breach of an exclusion notice is described as being an “offence” of “civil trespass”. if an excluded person is convicted of another offence against any partnership member, the existence of an exclusion notice will be considered as an aggravating fact and would be reflected in the sentence imposed by the court. I find this astonishing; the magistrates should not be pre-judging cases in this way and ought only decide if something is an aggravating factor in relation to a particular offence at the time they are considering their sentence for that offence. I regard it as good news that the business community in the city centre has brought forward this BID initiative. The city centre is a focus of business activity and it seems appropriate and fair that businesses would want to make a larger contribution to mitigating the impact this has on the city, in particular helping it to be cleaner and safer This is something everyone can benefit from, not only their own customers. BIDS have been successful in lots of other places and it is positive that businesses here in Cambridge have now created a similar opportunity. I have just been forwarded an email from Liberal Democrat City Councillor Colin Rosenstiel angrily saying that those who are interpreting the above quote as a statement in favour of the proposed tax and CBBID organisation are misrepresenting Cllr Bick’s views. Rosenstiel claims Bick is merely supporting the process and not one outcome over the other, ie. not taking a view on if the Cambridge Tax ought be introduced. As Cllr Bick said at the public meeting there would be a report, and a meeting at which the decision would be made, so presumably he will reject what officers are recommending. On the 20th of September 2012 I attended the public meeting held by the Cambridge Tax organisation in the Granta Suite at the Double Tree By Hilton hotel. I sought, and obtained, an assurance in the public section of the meeting from Cllr Bick, the leader of Cambridge City Council that he would take the decision on using the council’s veto at a public council meeting after having considered a report from his officers assessing if the veto ought be used. I also obtained an assurance that all funding of policing related activity, particularly taxi marshalls, and the exclusion scheme, would go via the Community Safety Partnership ensuring some degree of democratic oversight. Other interesting points included members of the Cambridge Tax organisation claiming they could not put anyone on the BID board who was not paying the levy, and saying this explained the absence of representatives of Cambridge residents. This was a point made repeatedly during the informal elements of the meeting, but not in the plenary session. One or two of the fifty or so people present other than the Cambridge Tax organisation members spoke in favour of the tax; their argument was that it would be fairer as it would reduce “freeloading” and ensure more people contribute to the Christmas Lights. All members of the Cambridge Tax organisation appeared to be briefed to say “Are you against Christmas lights?” and then when the response of “No” came they followed up saying “then you should support the BID”. One of those present said they had not heard of the current city centre management organisation, Love Cambridge. I thought this surprising given we were at a public meeting to discuss the future of Cambridge’s city centre management. I asked who he was, saying it would be interesting to know who Love Cambridge have failed to engage with, he responded to say he would not give his name on the grounds that I had “doorstepped” his wife. He was sitting next to Jane Singleton of the Federation of Cambridge Residents’ Associations who is also the chair of the Little Newnham Residents’ Association; who approached me outside a secret briefing by council officers on Cambridge’s local plan to which she was controlling access. Jane Singleton’s husbands statement to the Cambridge Tax meeting saying I had doorsteped his wife was in my view libellous, it was untrue; Luke Crane of the Cambridge Tax organisation who was chairing the meeting did not ask for it to be withdrawn, and nor did I get a chance to respond. Having libellous statements made about you is a risk of engaging with public debate and is perhaps one thing which puts many of contributing to discussions of how we run our society. I hope that as I obtained, through my questioning, some of the key assurances and revelations which emerged from the meeting overall those present would not have left with a lesser opinion of me than when they entered. As Love Cambridge engaged primarily via Residents’ Associations it is interesting that the husband of the chair of a Residents’ Association did not know of its existence, and suggests the strategy for engaging with residents was not working. Andrew Watson of No2ID spoke, saying he was concerned that Cambridge Tax Organisation staff might try to stop people like him campaigning. He was told that the staff would not have such powers, however he expressed concern that business owners might pressure them to move people on, or they themselves might not understand the extent of their powers. His and others’ similar concerns were responded to by the Cambridge Tax organisation who said that if the organisation’s staff did overreach their powers then the police could be called to resolve the situation. I and Mr Watson tried to argue that the Cambridge Tax organisation should operate transparently, for example publishing detailed financial information and minutes and papers for board meetings, or even voluntarily agreeing to comply with the Freedom of Information Act, board members did not appear too keen on any more openness than legally necessary. 1. At the public meeting on the 20th of September Cllr Bick, in response to a question I asked, promised the decision on deploying the council’s veto on the CBBID would be made in public, at a formal council meeting, following the consideration of a report prepared by council officers discussing if the veto ought be used or not. Can Cllr Bick repeat this pledge here today and announce the date, time and location of the meeting to be held to consider the veto? 2. The current Liberal Democrat statement, approved as council policy in May 2012 includes the following aspiration: “A city whose citizens feel they can influence public decision making”. Does Cllr Bick consider the CBBID proposals conflict with that policy? My view is that the CBBID is directly in conflict with that because it is taking decisions about the city centre out of democratic, and therefore, public, influence and handing them over to a small group. Not even those with a vote in the ballot have ongoing influence on the details of how the tax raised will be spent. 3. Can Cllr Bick repeat his pledge given to the 20th September 2012 public meeting that all policing related elements of the CBBID scheme will be carried out by giving funding to the Cambridge Community Safety Partnership; giving some democratic influence and oversight of the operation of schemes including the taxi marshals, the exclusion scheme, and perhaps dependant on their emergent role the CBBID staff on the streets. 4. How has the CBBID business plan been communicated to those eligible to vote and how will the ballot papers be distributed? 5. What is Cllr Bick’s view of the the level of support for the BID proposals among the residents of Cambridge? Richard you raise very real concerns about the securoty and policinng of the city centre, and the lack o any democratic accountability of what will essentially be handing over some significant controls over our city centre to private business. Councillor Bick and the Love Cambridge body seem intent to ignore these concerns, and it appears clearly in their interest to do so. To give up public spaces to private conerns to fund christmas lights seems a poor deal. Further when you look at the area intended to be subsumed by CBBID one sees it includes Parkers Piece. Why is that? One can only assume that the security guards currently patrolling the Grand Arcade are to extend on behalf of bussinesses their remit to this public space. Should we not be concerned? Cambridge First was pressured by Ian Sandison into not publishing online the article above (which appeared in print) as he said it was inaccurate and unfair. My understanding is he leaked the upcoming story to the News so they could run a positive slant before the CF story came out. Cambridge City Council’s strategy and resources scrutiny committee on the 3rd of October 2012 saw an unprecedented three hours of public speakers (about 30 people) all raising different points. The committee recommended the leader state there is no conflict between the BID and the city council’s policies and there is no justification to deploy the council’s veto. The committee recommended the council use its votes to vote in favour of the Cambridge Tax. Labour wanted the council to abstain and the vote was tied 4-4 and chair Cllr Brown had to use her casting vote to get the recommendation through. Cllr Bick agreed, but subject to an assurance that the CBBID staff will not take on any police, or psudo-police powers. This was achieved after Andrew Watson expressed concern about the use of police powers by four BID schemes elsewhere which had made no mention of them in their business plans. *Conflicts between public funded, and “Cambridge Tax” funded contractors working on eg. cleaning the same street. *The council is to pay its tax up to two months early, but to get nothing for doing so. *The BID organisation may change their projects within the BID proposal during the five years of the tax, and it is up to the BID board how they consult with “Cambridge Tax” payers. The Cambridge Tax organisation gave an assurance there will be no impact of the “Cambridge Tax” on those such as the homeless or photographers and they will not be cleaned up and removed from the city “like chewing gum”. One speaker in favour said they hoped the CBBID would tackle anti-social behaviour, they didn’t define anti-social behaviour or say how they thought the CBBID could tackle it. There were a lot of people including supporters who complained about the lack of publicity about the proposals. Labour had an idea of suggesting a veto ought be considered if there was insufficient turnout, especially from among smaller businesses. The council’s head of legal suggested this was not acceptable grounds for a veto according to the regulations and Liberal Democrat Cllr Bick said he didn’t want to pre-empt the ballot. (Though he went on to conditionally accept a recommendation that means he has pre-emptively decided not to veto the proposals). Another key point raised at the meeting was that the council is failing to do things like clean the streets hence the desire for the CBBID. Interestingly it emerged the CBBID may well contract cleaning back to the council; and there was discussion about the problem of identifying clearly what the council currently does so the CBBID can be assured it really is getting something extra for any more money it puts in. The council’s Director of Environment, Simon Payne, said he and personally cleaned the market square at 6am one morning, and he was sure those doing the work knew what they were currently doing so that could be pinned down, and eg. extra wash downs scheduled. One other point – the Cambridge Tax organisation said they would spend some of the tax raised establishing cycle courriers so deliveries could be made to out of town locations and then items cycled into the city – in an effort to reduce congestion. Let us hope they avoid riding on the pavement, and the consequent anti-social behavior convictions! I am stunned at not being able to find any comment about the result of the cbBID ballot on the internet or in the papers. Whilst cbBID supporters are crowing about the 67% vote in favour, nobody seems to find it necessary to mention that the turnout was just 33.2%. If my maths doesn’t fail me, this means that just over 22% of the businesses about to be taxed actually approved the scheme – or to put it another way, just under 78% of businesses either didn’t vote or voted against. The city council’s claims to have no control over the process is just plain wrong. Detailed examination of the legislation reveals that support from the local authority issuing the levy bills is a pre-requisite and that they are required to monitor and approve the BID company’s activities throughout the BID term and on into any renewal (yes, there will be renewals for further 5 year terms!) No BID would consider proceeding without the approval of their local authority (who tend to approve BIDs because they pay for services the council should be supplying but can’t afford). In short, you’ve been stitched-up, Cambridge. If you don’t stop this BID now, you’re all in it for the long haul! The time to make it stop is when the first bills go out (believe it or not, a significant proportion of that 78% will not suss that the levy applies to them until they actually receive the first bill … at which point most likely all hell will break lose!) Naturally, none of this is ever mentioned by the plethora of BIDs consultants, support organisations (led by the ATCM) and participating local authorities out there …. but that’s because they all have a vested interest in not rocking the boat. Get some big Cambridge companies that object to their bills to band together and challenge Cambridge City Council to hold a re-ballot where more than 50% support has to be received from companies holding actual BID levy bills in their hands as opposed to a vaguely worded promotion campaign that nobody thought applied to them! I too think the first bills will come as a shock to some people. I think those pushing the BID focused on effectively bribing some people to vote by arguing they’d be better off with the tax as the costs of things they already contributed to like CAMBAC, Pub Watch and Christmas lights would be shared out more fairly. If these promises are met, or if others who don’t benefit from many of the things the BID offers (eg. the non-retail businesses) will be happy to pay the tax, is yet to be seen. I’ve spotted Cambridge City Council’s 2013/14 budget contains £20,000 for “CBBid Software”. Presumably this is a cost to the council of adapting its systems to administer the collection of the tax. In response to a FOI request I made Cambridge City Council has revealed 617 out of 1083 BID Levy bills were not paid on time and £557,260.13 out of £725,925.10 was outstanding as of the due date. That is, as of the due date, only 23% of the tax levied had actually been paid. As of the 9th of July 2013, three months after the due date, there was still £58,005.79 outstanding from 123 levy bills. We hope that direct engagement with businesses/organisations about the BID and its activities will prompt a number to settle their outstanding levy invoice without the need for legal action. I wonder if Cambridge City Council will be adopting this soft approach to those failing to pay domestic council tax bills too? Cllr Blencowe complained the organisation had not exactly hit the ground running. The organisation reported it had acquired some offices and got its street ambassadors scheme underway. Councillors were told there have been eleven thousand interactions with the orange shirted ambassadors and the organisation is using them to keep in touch with its members as well as to provide assistance to the public. Councillors were also told Christmas Lights are now fully LED and more streets, including between the city centre and railway station will have lights this winter. A recent public communication from the Mill Road Coordinator stated that it is unlikely that the Mill Road snowflake lights will be put up this year. As Mill Road is not within the CBbid zone its lights scheme is no longer eligible for the Love Cambridge Christmas funding enjoyed by the other City Centre streets. I think it is better for Mill Road to be without lights than to be part of CBid – do we really want to empower CBids security guards to potentially control who walks on Mill Road. The initial section of the above video deals with the question of security guards. CBBID has stated it won’t have security guards and their orange shirted staff have no security related powers. The Cambridge News is reporting fifty businesses are being taken to court for non-payment of the BID tax. Money raised via taxation has not been generated.